Former skipper Mathews (52) and Lahiru Thirimanne (51) struck half-centuries to take Sri Lanka to 165 for four on day three, after bowling out India for a meagre 172 in the opening Test. 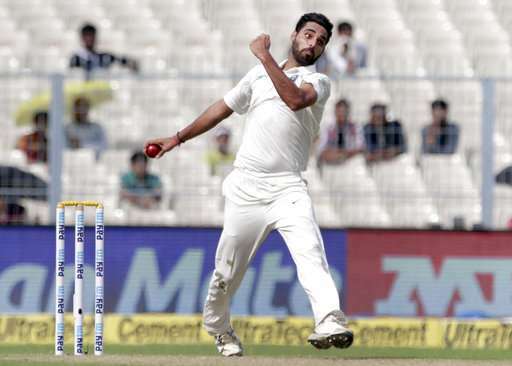 Sri Lanka all-rounder Angelo Mathews rated India's pace attack comprising Mohammed Shami, Bhuvneshwar Kumar and Umesh Yadav as top class and said that the batsmen cannot afford to relax against them. "Especially in the last few years, Indians have produced some fantastic fast bowlers. The three (Shami, Bhuvneshwar and Umesh) are top class and you need to be able to mentally prepared with good skills to tackle them. We definitely can, we have a very good batting unit," Mathews told a news conference after the third day's play. "All three are very skillful. They keep coming at you and you can't relax at all. If you see the loose balls were very minimal. They were top class," he added. Mathews (52) and Lahiru Thirimanne (51) struck half-centuries to take Sri Lanka to 165 for four on day three, after bowling out India for a meagre 172 in the opening Test. After Mathews and Thirimanne consolidated in the middle, Yadav dismissed the duo in successive overs. "We knew it was a challenging wicket and it was not going to be easy right from the outset. It's a big challenge for the batters, once in a while you play and your skill is tested. "It was not easy, they have been bowling really well. But (to handle them) it comes with experience, you learn when you play more. I've learnt quite a bit to handle this situation." The 30-year-old expressed disappointment that he could not convert his fifty into a century. "Fifties are not going to take us anywhere, we got to get to hundreds. It's not something that will do any help to anyone and my team. I know it's not going to be easy from here. We all know India are a fantastic team, we just have to be on the top of our game here," he said. Mathews said keeping the workload in mind, he has chosen to concentrate solely on his batting and it seemed to pay dividends. "I had a good sort of three years of cricket from 2013 onwards but my body is taking a toll now. I have to manage my workload. I think it comes with experience. I played a few more games and than the rest of the boys. "I've temporarily stopped bowling in Tests just to manage my workload and see how it goes. As of now playing as a batsman only," he said. Mathews sustained a calf injury to miss the entire series in Pakistan last month. "It has been a quite a frustrating year for me, especially with injuries. I've been going in and out of the side. It's not easy to have the same rhythm. I had a good two months' layoff. I'm in a good shape and hope I can carry on doing a good job for Sri Lanka," he said. Sri Lanka are seven runs shy of taking a lead with six wickets in hand but Mathews insisted there's a long way to go. "You never know, cricket is a funny game. We can't take the foot off the gas and got to score as many runs as possible. I don't know on this wicket, what is enough. In the next two days, we hope to get a result and play some good cricket." Mathews stepped down from all the three formats as captain after suffering a shocking ODI series defeat to Zimbabwe in July. "I can't think of being a former captain or as a premier batsman in the team. All are equal. I just have to go out there and take responsibility for scoring as many runs as possible and grab the opportunity." About the wicket, Mathews said it has not changed much from the first day when it was swinging. "On the first day it was seaming a little bit but today it was swinging around and seaming as well. We had to fight out. I don't think it changed drastically from day one. There's a still a lot more left for the pacers.